Discussion in 'Hardware Components and Aftermarket Upgrades' started by Corvette! It's Exciting!, Nov 27, 2018. Sorry if this is in the incorrect location. 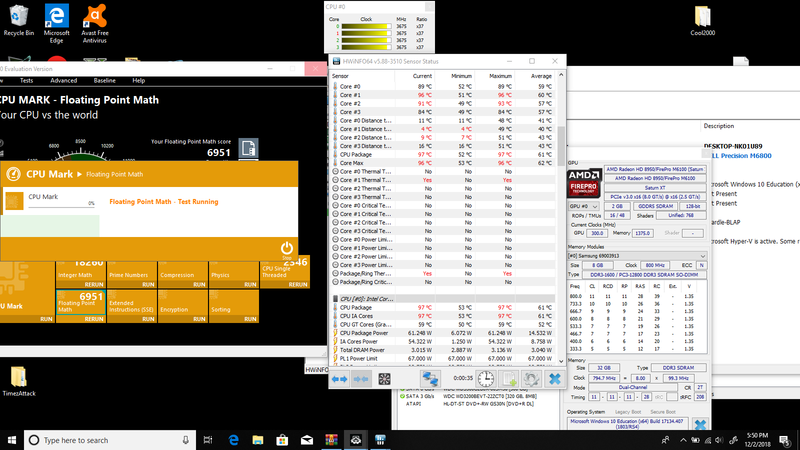 About a fortnight ago I swapped out the CPU in my dell precision to a 4940mx. I figured this would be fine since the computer shipped with this CPU from dell. 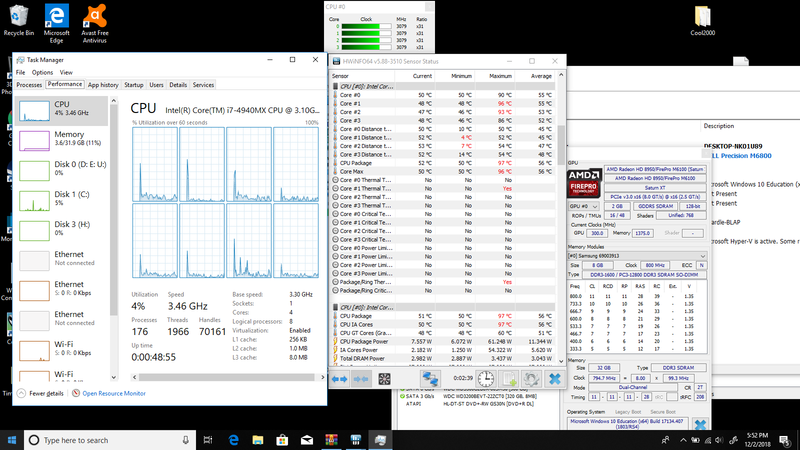 However upon installation the cpu stayed underclocked at a max of 3.5 ghz on all cores even after having the clock and/or the voltage bumped up/lowered with XTU or Throttlestop. Only after updating the bios and then also using the "dell command power manager" to set the computer to "ultra performance" mode will the cpu go to stock or above. However, the The CPU will jump to 90C+ in a matter of 1-3 seconds when presented with a workload of any more than 20%. I've repasted the CPU twice but it seems like, (I have no objective metric to gauge this) The temp problem is getting worse. The fans will suddenly simulate a rocket launch over something as simple as watching a youtube video. Is there a problem with my CPU? I know haswell runs hot but this seems ridiculous. Could this be caused by the thermal paste I'm using? Thanks. Alright, since I've fought with this CPU for quite a while and am currently the holder of the highest performance to my knowledge I guess I would be the go to guy. First of all lets figure out which precision model do you have? 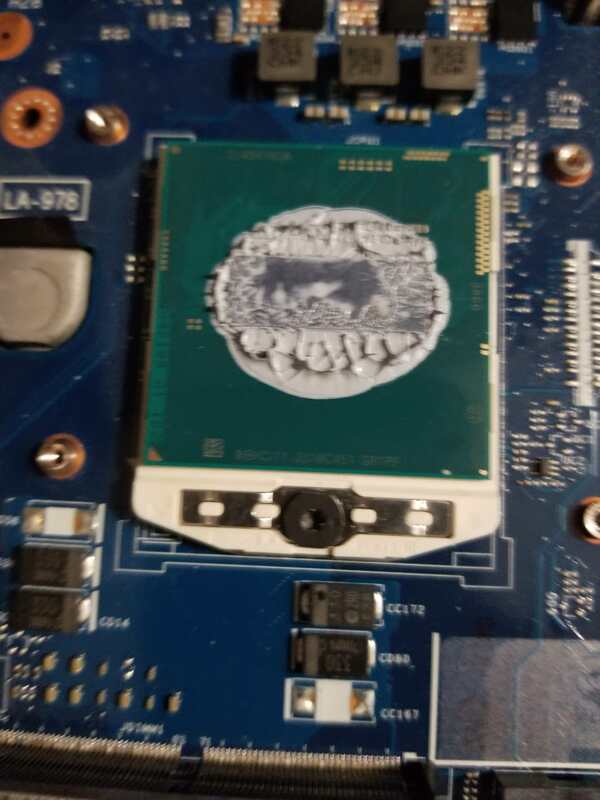 What thermal paste did you use?? I can already tell that you have a pretty bad heatsink fit. 20% usage in 1-3seconds 90+C is even for a terrible cooling solution not legit. Hey, thanks for the reply. I have an m6800, and I was using Thermaltake TG-7 paste. Can you remove the heatsink and make a picture of the Heatsink and CPU with thermal paste on?? This will give me a really good idea about your heatsink fit. Sorry for the slow reply! Here are some pics. Tell me if you need anything additional and I'll post it. Also, I know that I have about a gallon of thermal paste on the CPU. The first time I reseated the heatsink I used the correct amount but the second time I was roid raging about my thermals and used too much. Additionally, here are my thermals while idle and under a sort of mild load. I only ran the passmark floating point math test. The screen shot was taken roughly one second into the test. 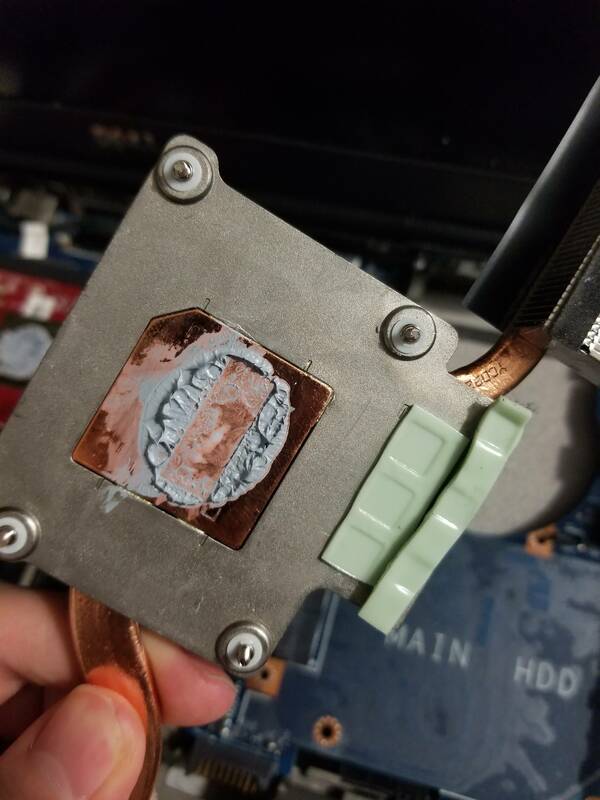 I mean its pretty apparent that the thermal paste is pushed away from the die. The fit itself is rather good, Maybe you should try something thicker like PK3 or ICDiamond. With that fit even liquid metal is quite valid. Alright, thanks. 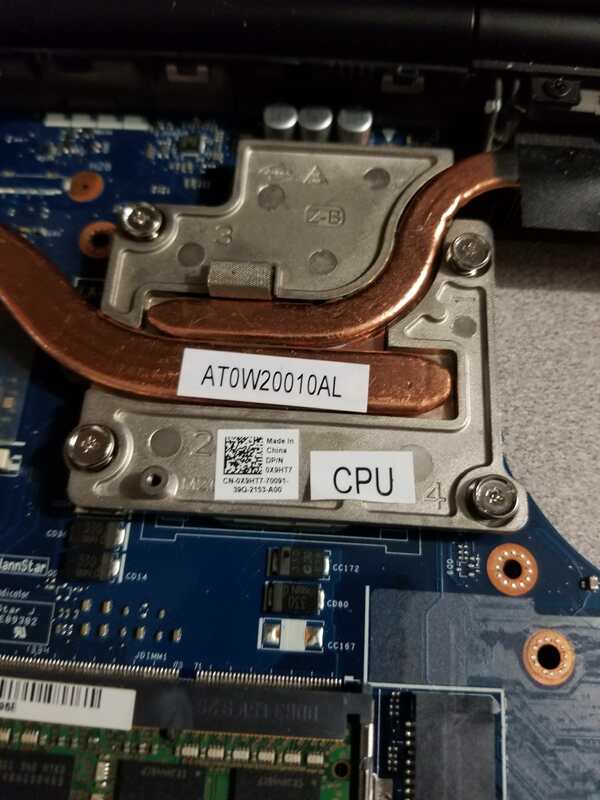 So you just think that the issue is the thermal paste? I don't have PK3 or ICDiamond on hand but I'll purchase some online now and try it out when it arrives. I'm not sure if I'm ready to do liquid metal yet though just because I'm a baby, worried about damage it might cause. Well as you can see yourself, half the thermal paste is basicially gone. With your current thermal paste you will always end with over-heating, order some kryonaut and enjoy the result.